The Temple of the Rose Cross, Teophilus Schweighardt Constantiens, 1618. Rosicrucianism (meaning "Rose Cross") refers to a family of secret societies formed in late medieval Germany, which taught esoteric practices that were concealed from the average person. The meetings of these societies were held in private and thus Rosicrucians became known as the "College of Invisibles." Rosicrucianism was based on an amalgamation of Christian mysticism with the occult tradition. Between 1607 and 1616, two anonymous Rosicrucian manifestos were published, first in Germany and later throughout Europe. These were known as the Fama Fraternitatis R.C. (The Fame of the Brotherhood of R.C) and Confessio Fraternitatis (The Confession of the Brotherhood of R.C.). The influence of these documents, presenting a "most laudable Order" of mystic-philosopher-doctors and promoting a "Universal Reformation of Mankind," gave rise to an enthusiasm called by its historian Dame Frances Yates the "Rosicrucian Enlightenment". Several modern societies, which date the origins of the Order to earlier centuries, have been formed for the study of Rosicrucianism and allied subjects. However, many researchers on the history of Rosicrucianism argue that modern Rosicrucianists are in no sense directly linked to any real society of the early seventeenth century. Members of modern organized Initiatic groups, which call themselves "Rosicrucian," thus date the beginning of the Order to much more ancient times than proposed by historians. Frater C.R.C. - Christian Rosenkreuz (symbolic representation). According to a medieval legend, the Rosicrucian Order was created in the year 46 C.E. when an Alexandrian Gnostic sage named Ormus and his six followers were converted by Jesus' disciple Mark. Their symbol was said to be a red cross surmounted by a rose, thus the designation of Rosy Cross. From this conversion, Rosicrucianism was supposedly born, by purifying Egyptian mysteries with the new higher teachings of early Christianity. However, most historians claim that the Order of the Rose Cross was founded in the early fourteenth century by a group of individuals who adopted the symbolic name of Christian Rosenkreuz. It was said that Christian Rosenkreuz had discovered and learned the Secret Wisdom on a pilgrimage to the East in the fifteenth century. According to Maurice Magre (1877–1941) in his book Magicians, Seers, and Mystics, Rosenkreutz was the last descendant of the Germelshausen, a German family from the thirteenth century. Their castle stood in the Thuringian Forest on the border of Hesse, and they embraced Albigensian doctrines, combining pagan and Christian beliefs. The whole family was put to death by Landgrave Conrad of Thuringia, except for the youngest son, then five years old. He was carried away secretly by a monk, an Albigensian adept from Languedoc and placed in a monastery under the influence of the Albigenses, where he was educated and met the four Brothers later to be associated with him in the founding of the Rosicrucian Brotherhood. Magre's account supposedly derives from oral tradition. According to the Fama Fraternitatis, Rosicrucuanism crystalized in the teachings of the German doctor and mystic philosopher Christian Rosenkreuz ("Roses-cross"). Having studied in the Middle East under various masters, he had failed to interest the powerful people of his time in the knowledge he had acquired, so instead had gathered a small circle of friends/disciples founded the Order of RC (this can be similarly deduced to have occurred in 1407). Around 1530, more than 80 years before the publication of the first manifesto, the association of cross and rose already existed in Portugal in the Convent of the Order of Christ, home of the Knights Templar, later renamed Order of Christ. Three bocetes were, and still are, on the abóboda (vault) of the initiation room. The rose can clearly be seen at the center of the cross. At the same time, a minor writing by Paracelsus called Prognosticatio Eximii Doctoris Paracelsi (1530), containing 32 prophecies with allegorical pictures surrounded by enigmatic texts, makes reference to an image of a double cross over an open rose; this is one of the examples used to prove the "Fraternity of the Rose Cross" existed far earlier than 1614. 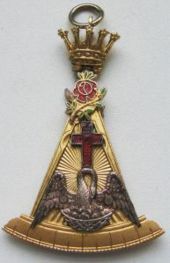 Led by Johann Christoph von Wöllner and General Johann Rudolf von Bischoffwerder, the Masonic lodge (later: Grand Lodge) Zu den drei Weltkugeln was infiltrated and came under the influence of the Golden and Rosy Cross. Many Freemasons became Rosicrucianists and Rosicrucianism was established in many lodges. In 1782 at the Convent of Wilhelmsbad the Alte schottische Loge Friedrich zum goldenen Löwen in Berlin strongly requested Ferdinand, Duke of Brunswick-Lüneburg and all other Freemasons to submit to the Golden and Rosy Cross, without success. After 1782, this highly secretive society - a secret society that had previously disseminated through its founder that the original Rosicrucians had left to the East (see section above on history) and a very different society than that of the Rosicrucian Brotherhood of the original Manifestos which had presented ideals of spirituality and aims of freedom and reformation for mankind - added Egyptian, Greek and Druidic mysteries to its alchemy system. A comparative study of what is known about the Gold and Rosenkreuzer, appears to reveal, on one hand, that it has influenced the creation of some modern Initiatic groups that were founded with an akin system; and, on the other hand, that the Nazism destructive ideology, supported in occult knowledge  and in a system of highly hierarchical and secretive organizations, may have been inspired by this German group (Gold und Rosenkreuzer) of the eighteenth century, and derived ramifications. During Rosenkreuz's lifetime, the Order was said to consist of no more than eight members, each a doctor and a sworn bachelor who undertook to heal the sick without payment, to maintain a secret fellowship and to find a replacement for himself before he died. Three such generations had supposedly passed between c. 1500 and c. 1600 and scientific, philosophical and religious freedom had now grown so that the public might benefit from their knowledge. It is evident that the first Rosicrucian manifesto was influenced by the work of the respected hermetic philosopher Heinrich Khunrath, of Hamburg, author of the Amphitheatrum Sapientiae Aeternae (1609), who was in turn influenced by John Dee, author of the Monas Hieroglyphica (1564). The invitation to the royal wedding in the Chymical Wedding of Christian Rosenkreutz opens with Dee's philosophical key, the Monas Heiroglyphica symbol. The writer also claimed the brotherhood possessed a book that resembled the works of Paracelsus. 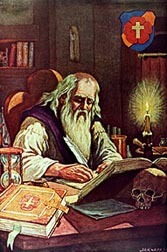 Some say the writers were moral and religious reformers and utilized the techniques of chemistry (alchemy) and the sciences generally as media through which to publicize their opinions and beliefs. The authors of the Rosicrucian works generally favored the Reformation and distanced themselves from the Roman church and Islam. The symbol of Martin Luther is a cross inside an open rose. The manifestos were not taken literally by many but were often considered either as a hoax or as allegorical statements. The manifestos directly state: "We speak unto you by parables, but would willingly bring you to the right, simple, easy, and ingenuous exposition, understanding, declaration, and knowledge of all secrets." Others believe Rosenkreuz to be a pseudonym for a more famous historical figure, usually Francis Bacon. The manifestos caused immense excitement throughout Europe: they declared the existence of a secret brotherhood of alchemists and sages who were preparing to transform the arts, sciences, religion, and political and intellectual landscape of Europe while wars of politics and religion ravaged the continent. The works were re-issued several times and followed by numerous pamphlets, favourable and otherwise. Between 1614 and 1620, about 400 manuscripts and books were published which discussed the Rosicrucian documents. The peak of the so-called "Rosicrucianism furor" was reached when two mysterious posters appeared in the walls of Paris in 1622 within a few days of each other. The first one started with the saying "We, the Deputies of the Higher College of the Rose-Croix, do make our stay, visibly and invisibly, in this city (…)" and the second one ended with the words "The thoughts attached to the real desire of the seeker will lead us to him and him to us." The legend inspired a variety of works, among them the works of Michael Maier (1568–1622) of Germany, Robert Fludd (1574–1637) and Elias Ashmole (1617–1692) of England, Teophilus Schweighardt Constantiens, Gotthardus Arthusius, Julius Sperber, Henricus Madathanus, Gabriel Naudé, Thomas Vaughan, and others. In Elias Ashmole's Theatrum Chimicum britannicum (1650), he defends the Rosicrucians. Some later works with an impact on Rosicrucianism were the Opus magocabalisticum et theosophicum by George von Welling (1719), of alchemical and paracelsian inspiration, and the Aureum Vellus oder Goldenes Vliess by Hermann Fictuld in 1749. Michael Maier was ennobled with the title Pfalzgraf (Count Palatine) by Rudolph II, Emperor and King of Hungary and King of Bohemia. He also was one of the most prominent defenders of the Rosicrucians, clearly transmitting details about the "Brothers of the Rose Cross" in his writings. Maier made the firm statement that the Brothers of R.C. exist to advance inspired arts and sciences, including Alchemy. Researchers of Maier's writings point out that he never claimed to have produced gold, nor did Heinrich Khunrath nor any of the other Rosicrucianists. Their writings point toward a symbolic and spiritual Alchemy, rather than an operative one. In both direct and veiled styles, these writings conveyed the nine stages of the involutive-evolutive transmutation of the threefold body of the human being, the threefold soul and the threefold spirit, among other esoteric knowledge related to the "Path of Initiation." 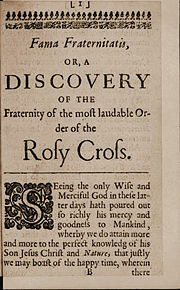 In his 1618 pamphlet, Pia et Utilissima Admonitio de Fratribus Rosae Crucis, Henrichus Neuhusius writes that the Rosicrucians left for the East due to the instability in Europe at the time (the forthcoming Thirty Years' War), an idea afterwards disseminated in 1710 by Samuel Ritcher, (Sincerus Renatus), an alchemist in Prague and founder of secret society the Golden and Rosy Cross. More recently René Guénon, a methodic researcher of the occult, veiculated also this same idea in some of his works. However, another eminent author on the Rosicrucians, Arthur Edward Waite, presents arguments that contradict this idea. It was in this fertile field of discourse that many "Rosicrucian" societies arose. They were based on the occult tradition and inspired by the mystery of this "College of Invisibles." Things for to come we can foretell aright." The idea of such an order, exemplified by the network of astronomers, professors, mathematicians, and natural philosophers in sixteenth century Europe and promoted by men such as Johannes Kepler, Georg Joachim Rheticus, John Dee and Tycho Brahe, gave rise to the Invisible College, a precursor to the Royal Society formed during the seventeenth century. It was constituted by group of scientists who began to hold regular meetings in an attempt to share and develop knowledge acquired by experimental investigation. Among these were Robert Boyle, who wrote: "the cornerstones of the Invisible (or as they term themselves the Philosophical) College, do now and then honour me with their company". According to Jean-Pierre Bayard, two Rosicrucian-inspired Masonic rites emerged from the end of eighteenth century. One was the Rectified Scottish Rite, which was widespread in Central Europe where there was a strong presence of the "Golden and Rosy Cross." The other was the Ancient and Accepted Scottish Rite, first practiced in France, in which the 18th degree is called Knight of the Rose Croix. Although many attempts have been made to learn about the change from "operative" to "speculative" Masonry, no definitive answer has yet been found, other than that it occurred between the end of the sixteenth and the beginning of the eighteenth century. Two of the earliest speculative Masons for which a record of their initiation exists were Sir Robert Moray and Elias Ashmole. 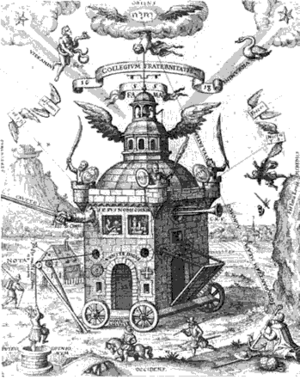 There is speculation that Robert Fludd, who defended the Rosicrucians in his writings, may have been a Mason, and that Fludd may have introduced a Rosicrucian influence into Freemasonry. Robert Vanloo states that earlier seventeenth century Rosicrucianism had a considerable influence on Anglo-Saxon Masonry. Hans Schick sees in the Rosicrucian works of Comenius (1592-1670) the ideal of the newly born English Masonry before the foundation of the Grand Lodge in 1717. Comenius was in England during 1641. During the late nineteenth and early twentieth centuries, various groups styled themselves Rosicrucian; some of these groups claimed to be the authentic legendary Rosicrucian Order, and others spoke of an historical lineage to the Order or a spiritual affiliation with the hermetic Order. The diverse groups who link themselves to a "Rosicrucian Tradition" can be divided into three categories: Esoteric Christian Rosicrucian groups, which profess Christ, Masonic Rosicrucian groups, and Initiatic groups, which may or may not be related to Christianity. There are a few connections between these including Martinism which studies Judeo-Christian mysticism, and quite a few other organizations that practice Esoteric Christianity in reverence, study, and ritual as well as claim descent from Masonic origin or unity with a secret Freemasonry. Another modern group, known as the Rosicrucian Fellowship (1909/1911), claimed to present the mysteries, in the form of esoteric knowledge, which the Christ spoke of in Matthew 13:11 and Luke 8:10; it seeks to prepare the individual through harmonious development of the mind (occultist) and the heart (mystic) in a spirit of unselfish service to mankind and an all-embracing altruism. According to this Fellowship, the Rosicrucian Order was founded in the year 1313 and is composed by 12 exalted Beings gathered around a thirteenth, Christian Rosenkreuz; these great Adepts are presented as belonging to the human evolution but have already advanced far beyond the cycle of rebirth; their mission is explained as aiming to prepare the whole wide world for a new phase in religion—which includes awareness of the inner worlds and the subtle bodies, and to provide safe guidance in the gradual awakening of man's latent spiritual faculties during the next six centuries toward the coming Age of Aquarius. ↑ Carl Edwin Lindgren, online The way of the Rose Cross; A Historical Perception, 1614-1620. panola.org. Retrieved July 16, 2008.Journal of Religion and Psychical Research 18 (3) (1995): 141-148. ↑ Frances Yates, The Rosicrucian Enlightnment, London, 1972. ↑ E. J. Marconis de Negre, "Brief History of Masonry," Excerpted from The Sanctuary of Memphis. (Paris: 1849). ↑ Further research in Legend and Mythology: Ormus, book-of-thoth.com. Retrieved June 25, 2008. ↑ Stanislas de Guaita, (1886), Au seuil du Mystère- Essais de Sciences Maudites. (Paris: Georges Carre, ÉDITEUR). ↑ René Guénon. Simboles de la Science Sacrée. (Paris: 1962), 95, etc. ↑ The Rosicrucian Interpretation of Christianity by The Rosicrucian Fellowship. Retrieved June 25, 2008. ↑ Max Heindel. The Rosicrucian Mysteries: An Elementary Exposition of their Secret Teachings. (lulu.com, 2005. ISBN:1887560386) .googlebooks.com. Retrieved June 25, 2008. Adamson, Henry. The Muses Threnodie, or, Mirthfull Mournings, on the death of Master Gall. Containing varietie of pleasant poëticall descriptions … with the most remarkable antiquities of Scotland, especially at Perth. Perth, 1638. Gandra, J. Manuel. Portugal Misterioso (Os Templários). Lisbon: 1998. Lomas, Robert. The Invisible College: The Royal Society, Freemasonry and the Birth of Modern Science. London: Headline Book Publishing, New Ed., 2003. ISBN 0747239770. Magre, Maurice. (translator), Magicians, Seers, and Mystics. Dutton, 1932. Marconis de Negre, E.J. "Brief History of Masonry," Excerpted from The Sanctuary of Memphis. Paris: 1849. Silberer, Herbert. Probleme der mystik und ihrer symbolik. ('Problems of Mysticism and its Symbolism'), (original 1914), reprint ed. Darmst, 1961. All links retrieved July 19, 2015. Arthur Edward Waite, The Real History of the Rosicrucians, 1887. This page was last modified on 19 July 2015, at 19:30.